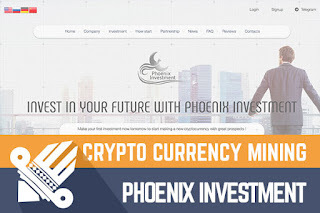 The second HYIP I’m going to review today is called Phoenix Investment, which is another cryptocurrency related program. Phoenix Investment joined the Golden Stage on DaidNews.com monitor 10 days ago, but it has been online since the beginning of September 2017. Now I have reinvested in this program $400 and will keep you updated about the payment status. I can’t say much about this program yet but will do my best to find out some interesting facts. Keep reading to find out more. Right after loading the website for the first time I had a feeling that the content has been translated into English from another language. Most likely it was done by a program or service. On the homepage, I found this slogan: “Make your first investment now tomorrow to start making a new cryptocurrency with great prospects!”. This text is placed right after the company name and I assume it’s important. However, it’s hard to understand what’s the essence of it. There are many other peculiar examples of strange translation - “Get start go «Signup» in our program”. I don’t mind if the admin is using Google Translate, but I would expect to find a reference to the Translation Provider to avoid misunderstandings. Probably, the best thing to do is make the original text as the main language of the website. Besides this awful translation, there are 3 other language options – Russian, German and Chinese. The program must have been online for at least one month. I have checked forums to find out conversations about this program and noticed a post from the beginning of the September this year. In fact, amount of comments has been very low, which means it hasn’t been very popular. Sure, we can’t blame the admin for not attracting tons of potential investors. It means that the programs have been inactive and we can assume it has been online since the beginning of October. It just seems to me that most of the HYIP admins have decided that UK registered company is a must do for every HYIP. Even though most of the content of Phoenix Investment has been translated and are hard to understand, the company has UK certificate of incorporation. Keep in mind that such certificate can be received by not leaving your home over the internet for fee approximately 100 GBP. From the company biography page, I understand that Phoenix Investment is positioning themselves as a cryptocurrency mining company. Unfortunately, it’s hard to understand background information due to the quality of the translation. Probably, you might get lucky in case you understand Russian, German or Chinese. I believe one of the three must be the original text. On Phoenix Investment homepage we can find information about four investment plans. There are few things you need to know about their investment plans. Firstly, the minimum deposit is starting as low as $50 in the first plan, but $20001 in the fourth plan. Basically, the only first plan looks realistic with its minimum deposit. Secondly, investors can withdraw their money only every Monday and it takes up to 48 hours to complete the withdrawal. Thirdly, minimum withdrawal is $10. Fourthly, the initial deposit is included in the payments and will not be returned at the end. Investors can add the balance using PerfectMoney, AdvCash, BitCoin or Ethereum. Money can be withdrawn using the same payment option for adding the balance to your wallet. As I wrote in the previous paragraph, first investment plan with 7.8% weekly looks most realistic with its minimum deposit of $50. In the next plan, 8.2% weekly minimum deposit is $2501. You might have noticed that such rates are common among long-term HYIP’s. This is not the exception with 7.8% weekly (1.1% daily) and deposit term is 25 weeks. Basically, it will take plenty of time to reach break-even point and to make a profit. For instance, $200 deposited in the first plan with would have 1.1% daily rate and $2.2 daily profit. Such deposit would reach its breakeven point after 91 days (approximately 3 months). At the end of the deposit term (25 weeks) the total profit would be $185. Looks great, but 25 weeks converted in months make it more than a half year. All things considered, we are looking at the HYIP with long-term rates. The website looks very simple and it looks like admin or web developer was in the hurry. Moreover, poor English translations make a very bad impression about the project itself. Especially, if English has been specified as the main language of the website. As usual, I’m here to collect the information for you to save your time. Even though admin tried to follow the trends and register the UK company, the overall impression of this program is poor. Sure, often we can see collapsing HYIP’s with both poor and great web design. However, no matter if you are a beginner or an expert, remember that all HYIP’s are highly risky and you are the only person responsible for your investments. Therefore, if you ever decide to make any investments, don’t invest more than you can afford to lose! Investment plans: 7.8% up to 10% weekly for 25 weeks.